Hello again Fury of Dracula! When I first heard that Fantasy Flight Games was releasing a third edition of this classic deduction and secret movement game, I initially thought ‘leave it alone already!’, but I’m happy to report I was completely mistaken. The combat system has been simplified and streamlined, the turn structure improved, balance tweaked, and rules bloat introduced in the last edition has been largely excised. Some small changes ramp up the tension towards the end as Dracula gets a bit more powerful. In fact it’s reminded me that I didn’t really get the second edition to the table very often; not only because the game was drastically changed from first edition, but that the changes made the game an unwieldy beast. It’s still long, but this an evening’s experience, not a light filler. This is without doubt the best version of the game so far, and an essential addition to every boardgamer’s library. It just feels right. And that special atmosphere of gothic horror the game has always had is still there, thanks in part to excellent graphic design and illustration. Sure, there was some outcry at the ‘laughing Liberace’ on the cover, but the game itself has matured into a wonderful balance of deduction, threat, and tense choices. 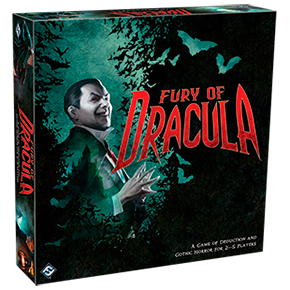 It’s a cat-and-mouse chase that’s particularly good at giving the Dracula player a chance to practice their evil cackling and gloating skills. What are you waiting for? Get yourself a copy. One minor typo on the rules summary: in the Setup section on p. 3, the last sentence of the penultimate paragraph runs “Dracula then” together as “Draculathen”. 1. Slide cards to right. 3. Choose a location card. I get why you don’t have a references listed in that spot…the stupid rules book didn’t either. They present it exactly as your summary sheet does. You have to go to the reference guide to see where it actually lists this part of Dracula’s movement in the right order. I don’t know if you think it is worth an update…(I know ultimately you do list the timing of this info in your maturing/lair sections), but in the higher level summary areas it is really jarring to not see any reference to this important part of Dracula’s movement phase. I’m curious what you think about this. Thanks! You’re absolutely right and I’ll improve this asap. I hate FFG’s new ‘two rulebooks’ system with a passion and this is a perfect example of why. They’re not only incredibly confusing, but it takes three times as long to make rules summaries from them! In the setup. Does Dracula place an encounter card on the starting location? Any plans on an update for fourth edition? Are there any significant changes?